Recommendations for Dual Master Cylinder conversion kits? 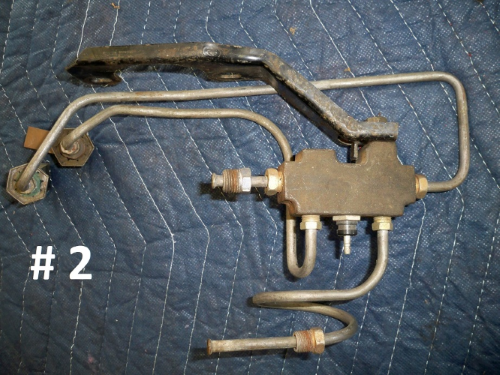 Re: Recommendations for Dual Master Cylinder conversion kits? Just for info here is a picture of what is stock. 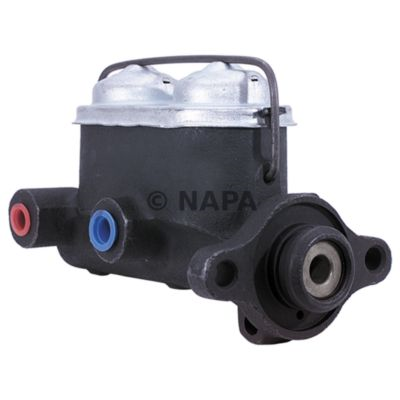 NAPA Auto Parts remanufactured not new master cylinder. Recommend you buy parts that the 68 & 69 Vairs used. More replacement parts that way. And the configuration is simple. You don't need the block on the side of the MC as that is to signal when fluid is low. I think the switch in the block is to warn when one side of the system looses pressure. Yes, Loss of fluid does result in loss of pressure. True but that isn't its purpose and you can lose pressure with plenty of fluid. Ya'll got it all wrong about that switch anyway. Whether high pressure, low pressure or no pressure, the switch will only trigger a warning light if the pressure between the two lines is out of balance. The switch doesn't know what the pressure is, only if it is balanced or unbalanced. Here is what I did for my 66 Corsa. I just bought a new Corvair Dual Mstr from the Corvair Ranch and used 67-69 brake lines and brass fittings from Clark's so it would be Plug and Play/Stop. On your 65, you could use another 65-66 style brass fitting as I mention in the link below. Then you would just need to plug up the unused holes. Because I have A/C, I have to use the firewall hugging lines from the 67 to 69 style so it fits behind the washer bottle. Check with Clark's to see if they have the lines from MC to Brass blocks you need that eliminate the switch. I know they are out there because caraholic4life got them with an order from the Corvair Ranch. Maybe Jeff can bend you a set? I love Clarks but their dual MC kits could be a lot more elegant for the price. I can't speak regarding the other's. I just make up my own. Yes indeed, when you add A/C into the mix, the cowl shelf gets a little "busy". One of the reasons I opted to move the dryer to the 65 engine compartment location. Has anyone used a dual master that has the lines exiting on the other side, and if so what were the problems if it wasn't intended for a Corvair? I think it's a cleaner look. I'm looking to ditch the single on my '63 for a dual, but I don't like the line clutter as seen on the Clark's upgrade/conversion. Not my car, picture supplied by JimBrandberg in a response to my question. 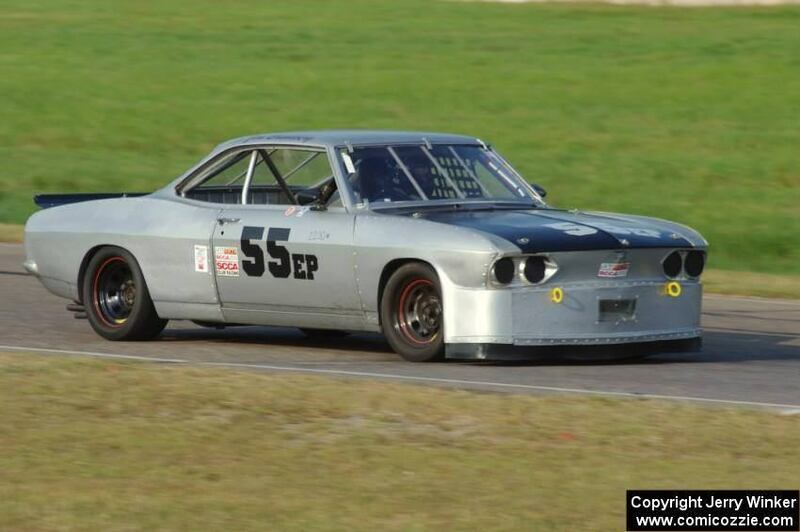 MY Monza Coupe looks like Phil Dally's Vair. My More Door Vair was a home made installed system without removing tank. It will be turned to GM production if the tank ever comes out. 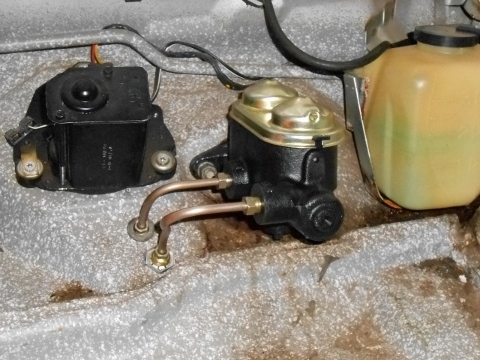 What does taking the fuel tank out have to do with master cylinder conversion? The "T"s go into the passenger compartment. Brake line to the rear of the car goes down through the interior to the tunnel. Now it is nice to drop the tank (even a little) to replace the right front brake line!